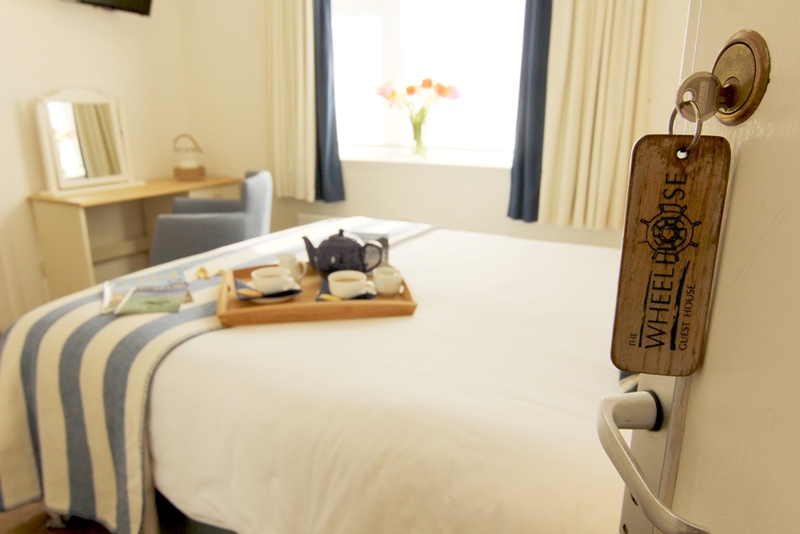 The Wheelhouse has nine beautifully appointed en-suite rooms, featuring our favourite coastal fabrics. All of the rooms are a bit different, so to help you find out which is right for you, why not take look at our photos by clicking on the room numbers above. All rooms have tea & coffee making facilities, flat screen TVs, iPod/iPhone docking clock radios, hairdryers, handwash, hand lotion, shampoo, conditioner & shower gel. Beach towels are provided for your use. Our guests are welcome to use the guest house and garden all day long. Wi-Fi access is available to connect to in the guest lounge. Our terrace and south facing garden have wonderful sea views, perfect for reading a book, watching the world go by or just drifting off. Our garden has a distinctly sub-tropical flavour thanks to the impact of the passing Gulf Stream. It soaks up the sun all day long, and so can you whilst listening to the waves lap upon the shore. Remember, Jen and Dan are always on hand to ensure your stay is a comfortable and memorable one. Please refer to our Access Statement for details of all rooms or contact us if you have any questions.